There are writings one can read in which a whole new venue opens. Such was the case with my first reading of the Robert Service poem, “To the Men of the High North”. I was thrilled and frightened by the reading. I was all of 10 years when I first read it. But I soon forgot it. It affected me, but did not open doors for me. It was, therefore, not the initial reading, that so engraved the lasting mark on my mind, but the reintroduction. It can be said that many things are written on bathroom walls, which are often read but should not be. It is rare that something is placed upon the walls of stalls that can be found worthy of reading, let alone retaining for memory. But once upon a moment, for me, it did. the mysteries that shroud the Polar Zone. There was not attribute given. Thus, I did not know whom was being quoted. I only knew, I had heard it before. And that I must find out the writer’s name. This was in the early days of the building wave of information access. To become known as, the Internet. So the search for information was still conducted the old-fashioned way: Library card files! What I had sought since May 1975, I would find in January 1990, the technology that became the Internet. Needless to say, I neither asked the right people for help and I did not find the information in the hell-hole, known as the Dewey Decimal card file system! Thus… the WHOM behind the verse went unanswered. Fast forward to the year 2004. I was doing my usual Google Search for one thing and finding an entire Universe of something else, vastly more interesting and informative. In the process I came across the quote again. But this time, I was able to bread-crumb it back to the source. VOILA! I found Robert Service and and a wonderful online compilation of his poetry. In honor of the fabulous writing of Robert Service, I have produced this eLITHOGRAPH image, from a photo I took in 2004 while in Alaska. When I took the photo on 10 October 2004, standing alongside a paved highway, looking out over this glacier fed river in the heart of the Alaskan wilds, my mind immediately went to the Robert Service poem, “To the Men of the High North“, I had rediscovered only a couple of months earlier. It fit. I so amazingly fit. I saw it. Smelled it. Tasted it. The ‘intrepid ones’… I could hear their voices. And I thanked them for their courage and suffering. I still do. This eLITHOGRAPH is named, “Nameless Rivers Flow”. It measures 34″ x 24.5″ and prints out as a watercolor. A ‘Throw Back‘ photo caught my eye when it was posted by ‘Friend-Not-Yet-Met’, Bill Elliott. As many of my FB Friends know, such a collision of image and timing – can generally dislodge a story, poem, haiku or some sort of textual creation. This event, was no different. 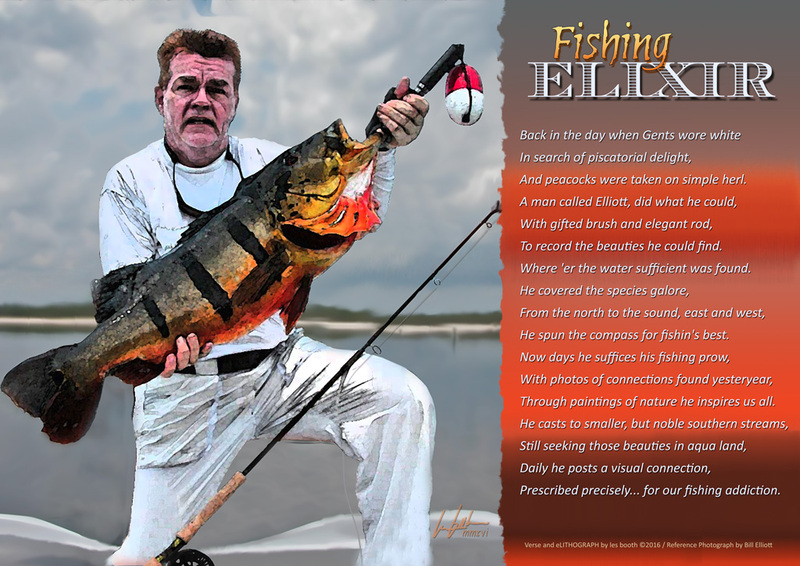 Taking the image and recreating it as an eLITHOGRAPH and composing a few lines of verse to fulfill the promise of story – combining them – I built the following full image montage – recapping Bills illustrious career as a top sporting life illustrator, painter and spokesman for outdoor activities. eLITHOGRAPH: ‘Fishing ELIXIR’ measures 17″x15″. ‘Artist in-Situ’, as well as permission to create from his original image.